Along the Dufferin Terrace in Old Quebec in Quebec City, Canada a row of cannon guns have been reconditioned and are displayed for visitors to catch a glimpse of history. These cannon guns sit along the waterfront and were a major part in the protection of Quebec when it was under attack. Today, they are only for display and adorn the grounds with the Terrasse Dufferin Hotel situated close by. 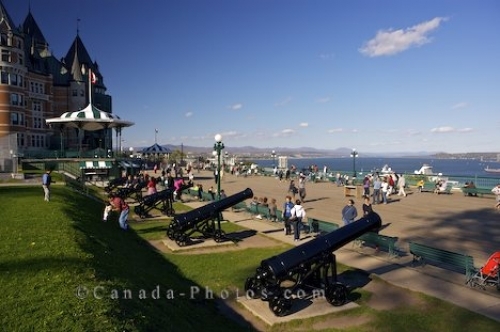 Picture of the cannon guns displayed along the Dufferin Terrace in Old Quebec in Quebec City, Canada.